Also tonight and tomorrow, Ballet BC presents Grace Symmetry, an evening of three works including two world premieres by Kevin O’Day and Medhi Walerski. The evening is presented with Turning Point Ensemble, an exciting collaboration of live music and dance. At the Queen Elizabeth Theatre, 8pm. Tix. For those that like to partake later in the evening, Bob’s Salon offers yet another evening of wine, storytelling, music and dance. Friday Feb. 21st Dance: Daina Ashbee, Diego Romero and Hailey McCloskey. Music: Max Murphy, Ben Brown, Russel Scholburg. Story: Henry Tsang. Host: David McIntosh. These really are amazing evenings of creativity and laughter! At Unit Pitt Projects, 236 East Pender, 10pm to midnight. FREE! February 22 – 24, the Chutzpah! Festival opens with the first of it’s dance shows with the award-winning LA-based repertory dance company BODYTRAFFIC. 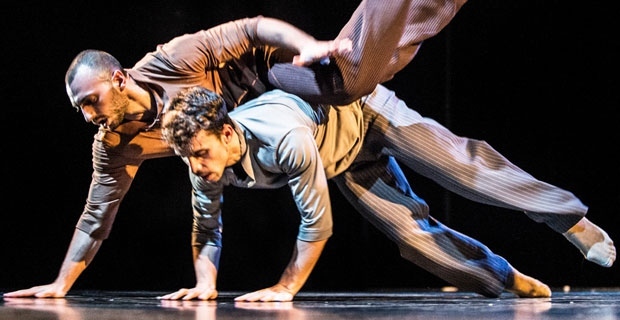 The company will perform three works, including a piece by Hofesh Shechter -known for delivering intensely physical, breathtaking work that immediately connects with audiences and is renowned for its raw, vibrant edge – partially created in residence here in Vancouver. There is much dance to be seen at the Chutzpah!Festival – find out more. Norman & Annette Rothstein Theatre, JCC, 950 W. 41st Ave. and Saturday and Monday 8pm, Sunday 2pm and 7:30. Tix. ~ by DanceHouse on February 21, 2014.